A vice-free radio singer wants to experience the dark side of life, so a press agent convinces her sponsor to choose a "professional sweetheart" from her fans. Retired British general Brunswick reminisces about the days when he was a colonel in charge of a British Army battalion fighting against native rebels in colonial India during the late 1800s. Joan Ogden: But we ARE going to be married, aren't we? 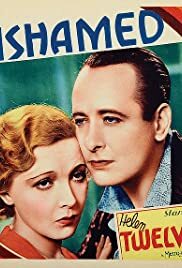 Helen Twelvetrees is a spoiled rich girl who falls for an obvious cad. He wants her money. She wants him. Her father doesn't approve. His hardworking father, Jean Hersholt, doesn't either. Most of all, her brother doesn't approve. The brother is played by Robert Young. He gives an excellent performance that is not at all perky or cute. His character seems dazed but also driven. Indeed, there is a strong hint of more than brotherly love in the feelings he shows for her. Notging like those in "Scraface," still shocking over seventy years later. But it's there. The movie is very good and never gives in to sentimentality. I like Twelvestrees. She was attractive and acted well. She ought not to have been shot from behind, which she is often in his movie. Her face, not her derrière, was her strong point.